EKC is thrilled to welcome star Supercross rider Josh Hansen as a new client! Josh took home the gold for Super X at the Summer X Games last year and the year before. We can't wait to support him as he preps for this year's games at the Home Depot Center-- and hopefully more wins! Carlock’s original sound and style transcends musical genres, drawing and influence from such icons as Alanis Morissette, Fiona Apple and Sarah McLachlan. Carlock’s powerful and heartfelt vocals, melded with her sophisticated and melodic songwriting, create a unique musical style that has been embraced by a wide range of listeners. Tracks from her “Human” release have been receiving heavy play across the country on platforms such as Radio AOL, Women of Substance Radio, Appleseed Radio and on New York’s premiere rock station Q104.3. On “Human,” Carlock combines talents with her new husband, Keith Carlock, acclaimed drummer of Sting and Steely Dan, who provided the beats on the title track as well as other tracks on the album. Energetic producer Shane McConnell was called upon to fuse and inject the direction of the CD, keeping it fresh and unique. Four of the tracks welcomed the visionary input of Steve Skinner (Bette Midler and Chaka Khan), as Arnie Roman (Cher, Trisha Yearwood, Pointer Sisters and Celine Dion) brought his eclectic styling to the full-length release. Carlock’s greatest fulfillment comes from being able to perform her music to live audiences. Her truth and passion, which is ignited in her deliverance and aura on stage, is a golden testament to that. Tomorrow night, Carlock, accompanied by the genial vocal offerings of her backup singers, cousin Stephanie Float and Jennifer Dearing, will deliver the truth in her fun and sophisticated songs. 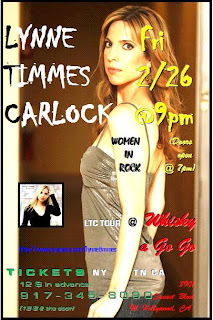 Lynne Timmes Performs will perform at Whisky a Go Go’s night of Women In Rock tomorrow, Feb. 26 at 9 p.m., at 8901 Sunset Blvd., West Hollywood., 90069. For ticketing information, please call 917.345.8090. To interview Lynne Timmes Carlock, please contact Eileen Koch at Eileen Koch & Company INC., 310.441.1000 or email Eileen@eileenkoch.com. Please visit www.eileenkoch.com. Eileen Koch & Company INC. (EKC) - the PR and marketing jewel in LA’s glittering crown - is expanding its brilliantly creative and fiercely competitive firm to include an exciting new advertising division, which will offer a smart selection of services, dabbling in everything from sports and fashion to luxury consumer products and entertainment. EKC, which has already mastered the art of branding by bridging the gap between client and public, now utilizes its unique talents in an even more creative way. For indeed advertising is all about innovation, and no one understands this more clearly and more acutely than EKC’s CEO, Eileen Koch. Her unmatched business savvy, strategic campaigns and personal touch have earned her a client roster that is as diverse as it is impressive. The decision to launch an advertising division was fueled by the increasingly varied needs of EKC’s clients. It became obvious to Koch that this was expansion was necessary and natural, and that it would assist the company in its continuing mission: To leave an indelible mark and impression. The newly established advertising division of EKC will be dedicated to the creation and implementation of some seriously 2010 advertising tactics for its clients, introducing a variety of dynamic promotional tactics while also devising creative marketing, branding and sales campaigns for its clients. Koch’s creative team is top-notch, and the addition of an advertising division to EKC’s already thriving company is yet another leap toward realization of the vision Eileen Koch had upon its founding two decades ago. Eileen Koch & Company - a history of serious recognition. Baltimore's FOX 45 News welcomed EKC client recording artist Laura Bryna into the studio this morning for an interview and brief live performance. The singer was in Baltimore this week for a charity gala for the National Guard Youth Foundation, of which she is a celebrity spokesperson. Laura chatted with the anchors and sang "640 Battfield Drive" before heading for her home state of Tennessee. We wish Laura a safe trip and can't wait to see her on FOX again, March 8, when she appears as a guest on Hannity! Even before the official debut of her stunning new spring creations, Linda Masquefa is already gaining the attention of purse and fashion blogs. Individuality means everything to Californian handbag designer Linda Masquefa. No more than five Linda Masquefa minaudieres of a single design are ever produced. "I wanted to go for exclusivity," the designer explained. "If a woman has my bag, she won't see it walking down the street." Each Linda Masquefa bag is handcrafted with exotic skins from Italy, including lizard, ostrich, calf hair, leather, python, stingray, and her favorite, crocodile. "I believe it's so elegant, so pretty, so classic," she explained. The simplistic designs lend themselves as easily to a dinner date as a glamorous soiree. 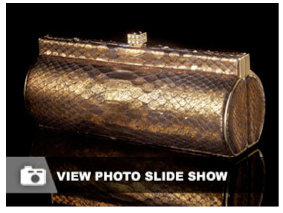 Considering their exotic skins and limited status, Linda Masquefa purses are surprisingly affordable. The pieces are priced between $800 and $2880. They are available from selected American boutiques and Linda Masquefa's online store. While Linda Masquefa currently specializes in clutches, she hopes to design day bags, a pet carrier, and belts. I love what I've seen, and can't wait to see what Masquefa can do with a larger canvas. Linda Masquefa’s minaudieres aren’t for everyone, but that’s not the point. Or at least it is extremely unlikely. 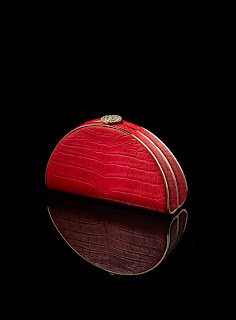 Masquefa’s small evening clutches are made of exotic skins and typically only five or fewer of each design are produced. The pieces cost $800 to $2,880 each. Masquefa, who was born in Santa Ana and grew up in Newport Beach (with the maiden name Jump), was inspired to get into the luxury handbag business during a trip to Central and South America in 2008. On March 2, 2010, luxury handbag designer Linda Masquefa will be showcasing her exclusive collection of handcrafted creations at the world culture inspired Pangea Restaurant in Panama City. The designer will be present to display her current limited number pieces, as well as reveal her newest collection. The Linda Masquefa Trunk Show finds the designer back in the land where her creative journey began. Inspiration first struck Masquefa during a visit to a Panama crocodile farm. The unique skins were the most exquisite, wondrous materials she had ever seen and were the catalyst to her couture handbag creations. 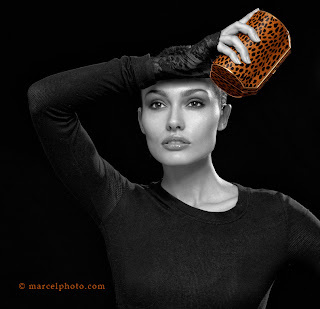 Marrying these exclusive skins with classic and innovative design, the most desirable handles, closures and accent hardware from Italy, and old world craftsmanship has placed Masquefa’s creations at the vanguard of true luxury handbag reinvention. Her luxury pieces are now housed in premier boutiques in Las Vegas, Laguna Beach and Panama City. Pangea Restaurant, which is ancient Greek for “entire world,” sets the perfect backdrop for the intricately imagined Linda Masquefa Collection. Six rooms, each in their own unique and distinctive style, and the multi-cultured platform exude the aesthetic and artistic idealism of Masquefa’s eclectic pieces. Pangea owner Gary Doherty called on the services of interior designer Jennifer Simpson to bring to life the most beautiful cultural imagery from around the world, invoking the spirit of old worlds past while melding the highest value of current technology. Each distinct room (Asia, Caribbean, East Africa, North Africa, South America and Indian Sub Continent) all holds claim to sought-after gourmet food and the finest consumptions. The Linda Masquefa Trunk Show will be held on Tuesday, March 2, from 7:00 p.m. to 10:00 p.m. at Pangea Restaurant, located at Calle Alberto Navarro, Casa 45-A El Cangrejo, Panama City, Panama. 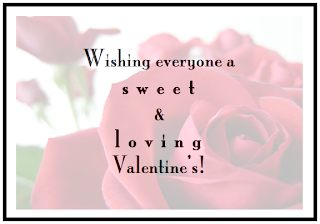 For reservations, email info@pangeapanama.com. For the latest news on Linda Masquefa, visit her fan page on Facebook and follow her on Twitter (@LindaMasqeufa). For more information or to interview Linda Masquefa, please contact Eileen Koch @ Eileen Koch & Company INC, 310.441.1000 or email Eileen @ Eileen@eileenkoch.com. Please visit www.eileenkoch.com. In light of rapidly slowing donations to Haiti relief organizations, leading national online ticket agent StubDog.com has announced the launch of “Unite for Healing Haiti,” a collective fundraising campaign where the company will donate 100 percent of the rest of this month’s proceeds to Doctors Without Borders. Also starting Monday, February 22, and continuing through the end of the month, sales from select event tickets donated by participating StubDog partners will go directly to Doctors Without Borders to support their continuing emergency relief efforts in Haiti and the nearly 70 other countries in which the organization provides aid. StubDog’s latest philanthropic effort comes as no surprise. The eclectic ticket outlet was founded on the principle of giving back, having donated a portion of sales to local charitable and community-serving organizations since its inception. In partnering with Doctors Without Borders, StubDog hopes to assist the organization in its mission to deliver medical care to people in need. Founded in 1971 by a group of French doctors and journalists, Doctors Without Borders provides medical assistance to populations around the world, specifically those affected by violence, neglect or catastrophe. In 1999, the organization received the Noble Peace Prize for its profound charitable impact. Flavorpill, an online daily guide to quality cultural events in New York City, Los Angeles, San Francisco, Chicago, Miami and London, is the featured sponsor and partner for StubDog’s “Unite for Healing Haiti.” Other partners that are joining StubDog’s cause to raise money for Doctors Without Borders include: Ars Nova, ComedySportz, Crown City Theatre, Houston Ballet, Houston Family Arts Center, Main Street Theatre, Musiqa, Murder Mystery Los Angeles, OC Roller Girls, Pacific Resident Theatre, Pocket Sandwich Theatre, SPQR Stage Company, The Duplex, The Kitchen, Unity Theater (Houston), and many others. To view the entire list of partners, visit: www.stubdog.com/haiti_fundraiser. Sign up for StubDog’s exclusive newsletter to learn more about “Unite for Healing Haiti” participating events by visiting www.stubdog.com. To receive daily updates, follow StubDog on Twitter (@StubDog) and become a fan on Facebook. A Sneak Peak at New Designer Linda Masquefa's Latest Bags! EKC just got ahold of these GORGEOUS photos from client Linda Masquefa's recent photo shoot! We're especially loving the the turquoise one-- could definitely see Penelope Cruz or Marion Cotillard carrying it down the red carpet at the Oscars, adding a pop of color to a classic gown. Hmm...We'll see! Eileen Koch & Company is pleased to welcome Bobbie McDonald, Psy.D. as a new client! "Dr. Bobbie" is a renown author, speaker, and founder of the Meridian Center for Hypnosis in Los Angeles. 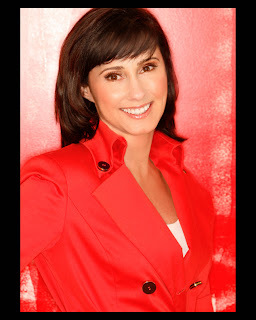 Dr. Bobbie's unique approach involves teaching self-awareness and understanding of the unconscious mind in order to enact positive change in one's life. Her compassionate and insightful guidance enables her clients to recognize their innate potential, and in turn "live their lives unlimited"-- Dr. Bobbie's mantra. We can't wait to get the word out about Dr. Bobbie and her one-of-a-kind philosophy! Amy Weber & Angelica Bridges: EKC's Friends Are Hotter Than Ever in 2010! EKC would like to congratulate our friend, model and former WWE diva Amy Weber, on her gorgeous cover for German Maxim. As always, Amy looks absolutely beautiful, and is in fantastic shape-- especially considering that she gave birth to twins last year! We'd also like to extend our best wishes to the equally stunning Angelica Bridges, who is looking hotter than ever in the new year! A client and longtime friend of Eileen, the Baywatch beauty is kicking off another exciting year as the star of the Luxor Las Vegas' "Fantasy," which has been called the most seductive show on the strip. Congratulations to Amy and Angelica on their sizzling careers! We see exciting things for both of them in 2010! This week, EKC is busy helping client designer Linda Masquefa prepare for a photo shoot with Marcel Indik for her spring line of uber-exclusive handbags. We conducted a casting of LA and New York's hottest models, in hopes of finding the perfect girls to help showcase Linda's gorgeous bags. Now that it's narrowed down to a few, we can't wait to see who will get to flaunt the new LM bags...Right before all the celebs do this award season! Eileen Koch & Company is excited to announce representation of My Beautiful T-Shirt, a hot new Italian clothing brand that features classic t-shirts with a funky twist. Designer Alessia Cavallaro starts her unique designs by creating high-quality, basic cotton tees in wearable colors. Then, she uses a patented mechanism to add detachable maribou trim for a chic and sassy touch. Young, fresh and fun, these tops are stylish and totally customizable. Worn sans trim, they're great daytime wardrobe staples; with feathers, they make a statement during a night out. We're thrilled to work with Alessia and can't wait to launch this awesome brand! The groundbreaking reality TV hit phenomenon “BOSS LADIES” trails five fabulous transgendered women who aim to launch a clothing boutique that features their brilliantly emerging line. The sassiest of the clan, Tempress, showcases her colorful, theatrical talent set against the backdrop of an elaborate artistic collaboration. “Boss Ladies” (produced by Red Label Media Group) is an altogether new angle on the reality TV front. Not only will viewers be intimately exposed to a world foreign to most, but they will also delve into the intricacies of the fashion and entertainment industries. 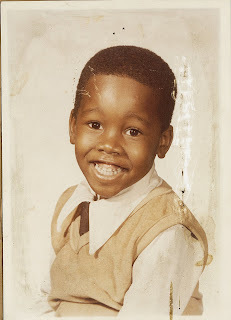 One of five distinctive personalities in this world of fashion and inventive reality television, Tempress grew up within the typical American landscape in upstate New York. A highly creative, dramatic sort, she promisingly found her way to the world of theatre, and it is in these formative years that shaped her mind, imagination and spirit. On “Boss Ladies,” Tempress brings a certain panache to the company of women, as impetuous as she is headstrong. And it is her dedication to her work that drives this self-made sensation, and which makes for such good entertainment! Hailed as a crossbreed of “The Real Housewives” and “Project Runway,” “Boss Ladies” navigates the personal and professional terrain of this grand task under the superlative guidance of established fashion designers and former reality TV stars. The remarkable five ‘boss ladies’ reveal their vibrant, entrepreneurial spirit as viewers follow them from conception of their line in Atlanta to completion of finally launching their boutique in Los Angeles. 2010 Grammys: EKC Loves Beyonce! As a former dancer herself, EKC's Eileen Koch was absolutely blown away by Beyonce's performance at the 52nd Annual Grammy Awards last night! Beyonce is definitely one of the most talented artists of this generation-- truly an icon. It wasn't at all surprising to watch her make history last night by taking home SIX awards. Congrats to always-fierce B for her wins! Keep up the awesome work! A thunderous clap of applause exploded from behind closed doors at the Sheraton Downtown Los Angeles hotel as James Malinchak dominated the stage espousing speaking and motivational tips that electrified an audience teetering on 400. That was a common scene at a recent three-day Wealth Builders Summit in downtown Los Angeles as America’s leading self-help experts worked the room sharing their guiding principles and product offerings designed to open the audiences’ mind to the unlimited possibilities of personal and corporate success. I pulled myself away from the California Room to steal a few minutes with co-producers John Halpin and Robert Finkelstein. I asked the duo to share with me and my readers how they met, what brought them together, and what their plans were for future Wealth Builders events.